The referendum result may have been the one that Labour wanted, but the party would do well to heed the warning sent to it by its historic Scottish strongholds. Three of the four regions that voted Yes are Labour-run local authorities. In a list ranked in order of the size of the Yes vote, Labour councils are concentrated in the top half, not the bottom. 10 of those top 16 are either run by Labour or in no overall control where Labour is tied as the largest party with the SNP. 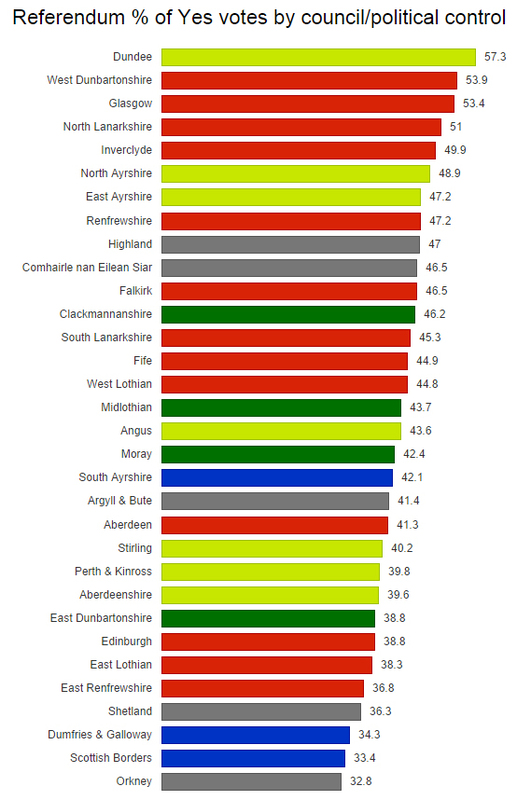 In the graph below, those Labour-SNP councils are coloured green. The others are coloured by the majority party – yellow, in this instance, referring to the SNP and not the Liberal Democrats. Grey councils are those run by a group of independents. Labour should be alarmed that such traditionally sympathetic areas like Glasgow and North Lanarkshire voted Yes, and that in other places like Falkirk and Fife almost a half of voters did the same. The party was nominally at the forefront of the No campaign – yet wasn’t able to persuade a large chunk of its supporters to follow the line. The SNP has its own questions to answer, of course – most pertinently, why did only one of the areas it runs locally (Dundee) vote Yes, while places like Perth & Kinross and Aberdeenshire saw a Yes vote down in the high 30s. But it’s Labour who ought to be terrified by the prospect of losing a slice of its Scottish wedge of support, not just at the referendum but also at the general election and on into the future. The question of independence may trigger a generational shift in the voting patterns of Scotland – one from which all parties will gain and lose in decades to come.